When we got home with it, Mike immediately took the heat gun to it and found out that it is painted (he wouldn't even wait to let me take a photo of it so you can see his "test spot" on the left drawer. The top is veneered but it seems to come off easily and there is a nice wood base underneath! We've been working on re-finishing another dresser that I've had since high school but when we saw this we knew we had to have it. It's the same style as our credenza and it's all wood, such a great deal for $20! We are thinking about painting it turquoise. 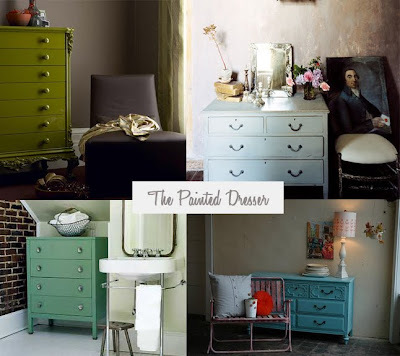 When we were in Savannah over the summer we came across a dresser in a design store that had been painted turquoise and ever since then we have not been able to stop talking about it. So, this seems like the perfect piece of furniture to attempt it on. 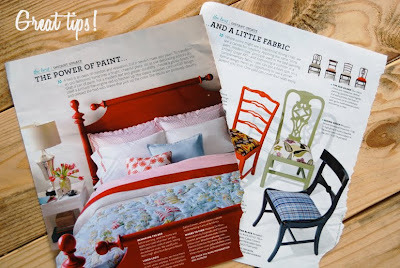 This month's issue of Martha Stewart has some great tips on painting furniture so it seems meant to be that we paint it! I will keep you posted with pics of this diy project! 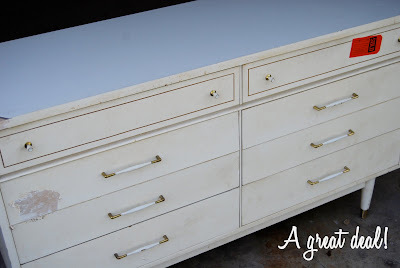 What a great dresser...I wish I had the motivation to redo funiture! It's hard work but it's so rewarding!